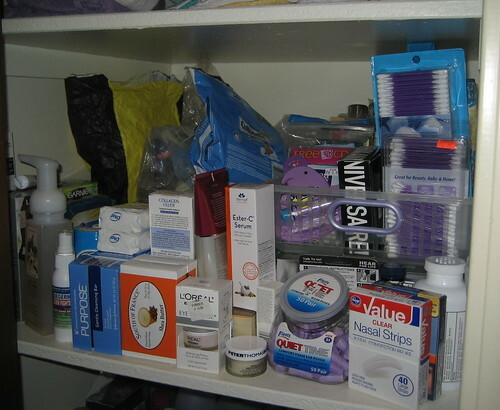 One of the items on my weekend to do list was sorting through the shelves in the linen closet that we use as a warehouse for toiletries and first aid supplies and cosmetics, things we aren’t using right now but will when we run out of the stuff in the bathroom. (Some things we use only sporadically get stored here, too, like hair remover wax.) I pulled everything out and made islands on the floor by category: nail stuff, makeup, hair stuff, bath stuff, eye stuff, first aid stuff, dental stuff, meds, soap, and other stuff. I found some things I could use right now, so those went into the bathroom. I found other things I could get rid of: the overlarge packaging for two lip glosses, for instance. I did end up putting most of the stuff back on the shelves, but at least now it’s more organized. Since I made a list as I worked, I now know what’s in there and where it is, which is an improvement on the jumble it was before. I’m not going to need to buy mascara or pressed powder or hand lotion or body wash for a long time. If the zombie apocalypse comes and I have to barricade myself in my house, at least I can stay clean and pretty until they break through and eat my brains. One always likes one’s meals to be pretty!